Poland on a whim. Genealogy Tour with Denise in 2016. Three years ago on a whim, I booked myself a ticket to Poland. I then booked a tour with PolishOrigins. I hoped and prayed that they were everything they claimed. My prayers were answered in the most spectacular way. 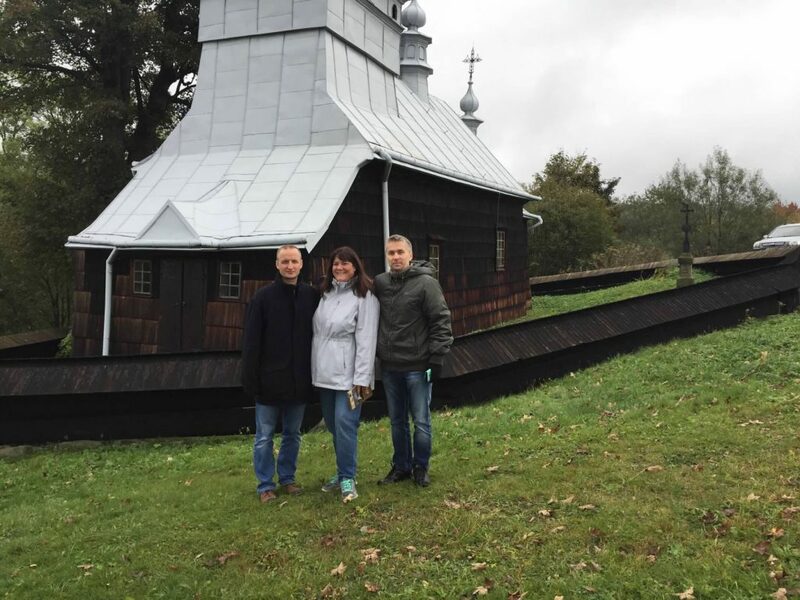 Denise, Krzysztof and Zenon in Krzywa in 2016. 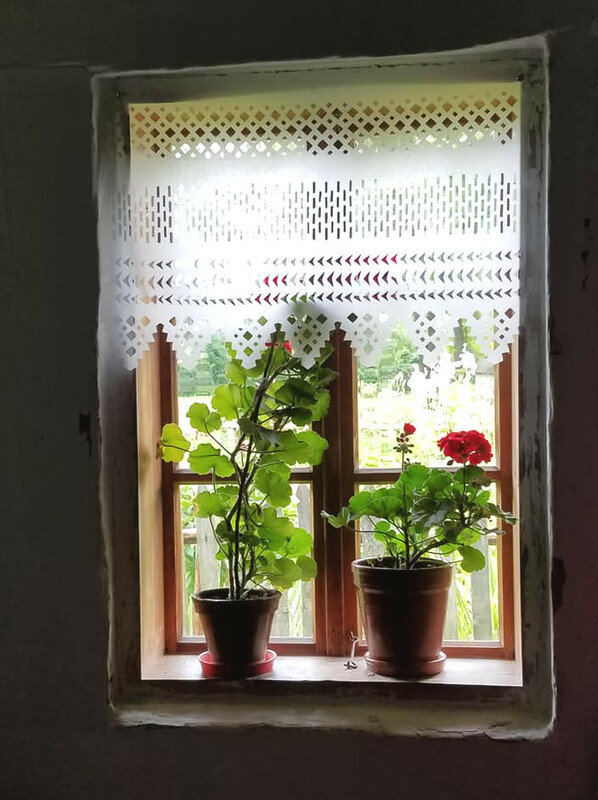 Forever more I will have the fondest affinity for red geraniums and white lace curtains…they are the welcoming symbols of every Polish living space. Photo credit: our guest from July 2018, Dawn S.
When my childhood and lifelong friend, Sue, and I were chatting last fall she said that she hoped to visit Poland one day, I agreed and said, “Let’s go in July!” and so we did. Many of you have asked how my visit was. This is my story, and these are my memories. Dawn and Walter’s trip to Poland and Slovakia. July 12, 2018 – A Necessary Hike. When we woke up we were very excited to see that there was no chance of rain for the time that we were planning on being at Spišský hrad, Spiš Castle that morning. 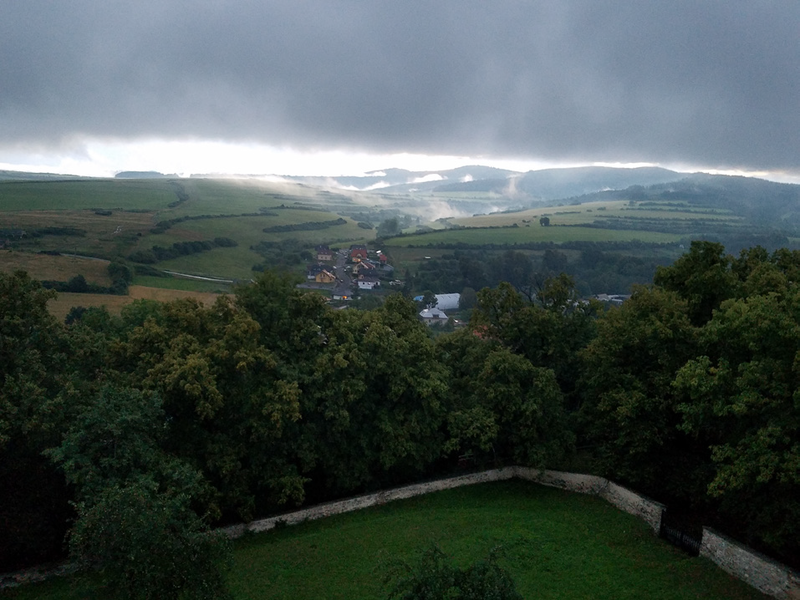 We had breakfast in the dining room of Boutique Hotel Pracháreň and we quickly returned to our room, finished getting ready for the day, and maybe snapped a couple of parting scenic photos out of our bedroom window. Dawn and Walter’s trip to Poland and Slovakia. July 11, 2018 – Time to Say Good-bye. At 8:30 we met downstairs in the dining room for our last breakfast with Lucjan. Today was the last day of the tour with him and although I was pretty tired from all the travel, family meetings, and sights I was feeling sad that our time was coming to an end. After breakfast we had made plans to sit and review what we had accomplished and to come up with a plan for what still needed to be done. Lucjan came to our room and he and I sat down in the sitting area to discuss things. We took this time to exchange gifts, I gave Lucjan two of the fabric bowls that I made, and he gave us a magnet and collectible plate from Przemyśl, his hometown. Before too long there was a knock on the door and a cleaning person informed us that it was check out time and that they needed to clean the room. They very generously offered to let us finish our discussion in a sitting room. 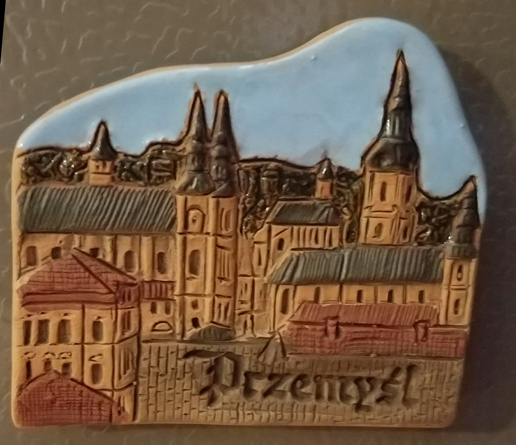 Lucjan gave us a magnet from Przemyśl, his hometown. Dawn and Walter’s trip to Poland and Slovakia. July 10, 2018 – How Many Meals Can You Eat Pizza in a Row. sometimes standing on one leg as she stretched and contorted herself into whatever shape was necessary to get the job done on the inside and outside of all the windows in the restaurant. By the time she was done the windows were spotless. The route of the fourth day of the tour. Dawn and Walter’s trip to Poland and Slovakia. 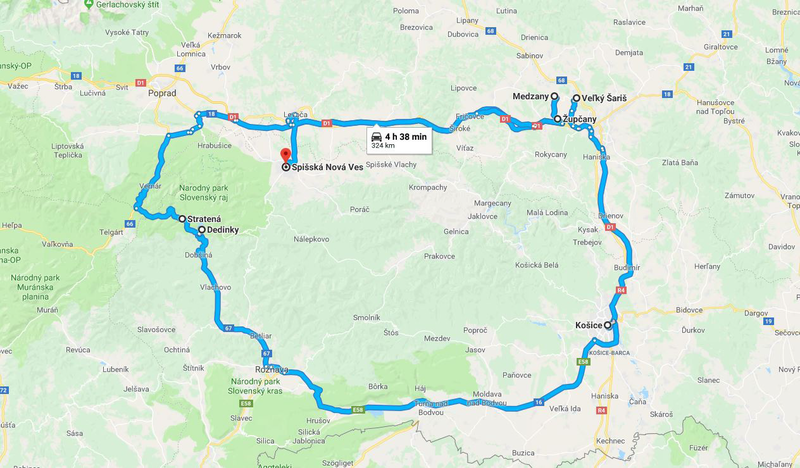 July 9, 2018 – On to Slovakia. We met Lucjan in the dining room around 7:45 and again had the huge breakfast buffet set out for us. We made sure to take advantage of what was set out, though I steered clear of the pâté and pork jelly. Walter and I ate a more traditional American breakfast and Lucjan, in what I am assuming was a more European way, had his breakfast, maybe including the pork jelly. No matter what continent we had come from we all indulged in the baked goods. Walter and Lucjan had discovered the joys of a Nespresso commercial coffee machine, one in which the coffee has the cream added at just the right temperature to create a masterpiece of coffee the day before. This morning they again made good use of it and by the end of our breakfast they were both suitably caffeinated and ready to go. The route of the third day of the tour. Dawn and Walter’s trip to Poland and Slovakia. July 8, 2018 – Cousins, cousins everywhere. Having been treated to a quiet and cool evening’s sleep we woke up raring to go. 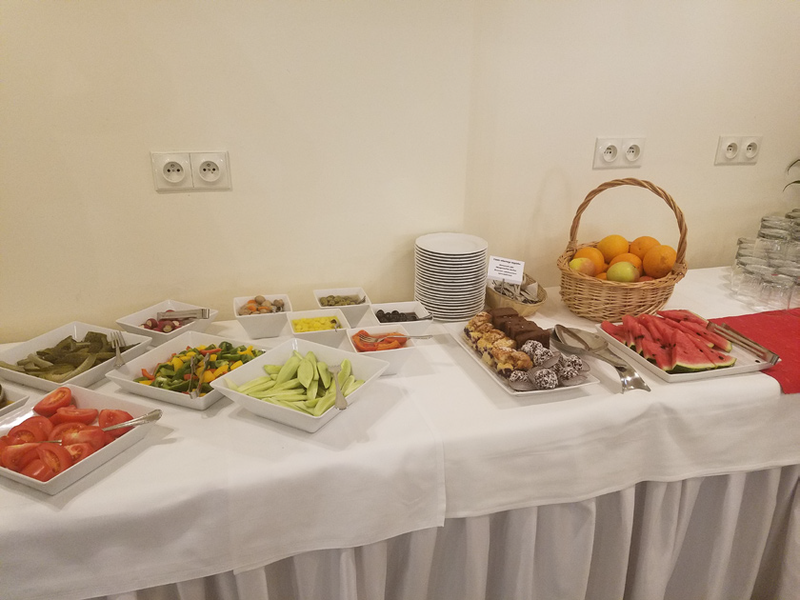 We headed down to meet Lucjan for breakfast and to check out the breakfast buffet that was included with our stay. I walked into the dining area and absolutely couldn’t believe my eyes, there was the biggest buffet of any type that I had ever seen. The biggest breakfast buffet I’ve ever seen. Dawn and Walter’s trip to Poland and Slovakia. July 7, 2018 – Genealogical Tour Begins. I started off with a little bit of a nervous feeling in my stomach, I am pretty good at recognizing these butterflies and identifying what causes them, this time it was pulling Walter, my husband, into my hobby on a big scale. I had really pushed the idea of doing this type of tour on Walter and what if it was a bust? We had been having so much fun and seeing so many things up until this point. Stop…take a deep breath…it is going to be fine. We got moving early at 6:45, very early for anyone who knows me. This was the way it was every day, and Sue, my friend that we had been travelling with us up until this point, would be driving us from Kraków, to Kombornia Poland. Route from Kraków to Kombornia.